Yoruba Actresses Seyi Ariyo She Baby and Kemi Afolabi Fight over Lover and Clothes! 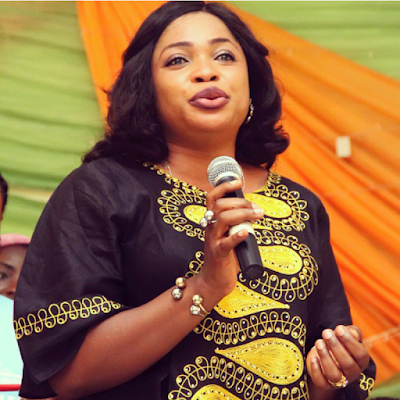 Kemi Afolabi has found herself in a bit of a mess.Two popular Yoruba actresses have been washing their dirty linen in public. 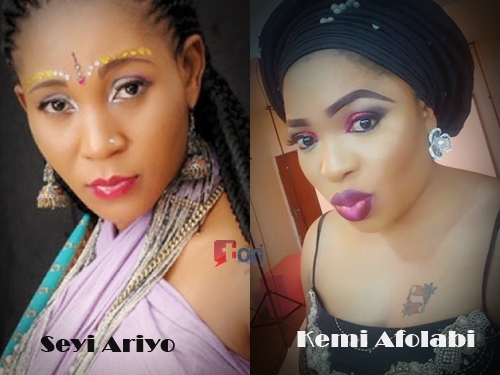 Screen diva kemi Afolabi and singer/actress/producer, Seyi Ariyo popularly known as She Baby have been going at each other for over a week over a popular actor Odunlade Adekola, who is happily married with four kids. Her message caught the attention of the President of Golden Movie Ambassadors of Nigeria, Saidi Balogun, who appealed to She Baby to retract the message. It really beats me why ladies like Kemi Afolabi and She Baby Seyi at the age where they should no better will choose to fight over a married man so publicly. Sources say reports emanated from Kemi's camp, claiming that She Baby was dating Odunlade Adekola and was just jealous because of the closeness between Kemi and the actor. 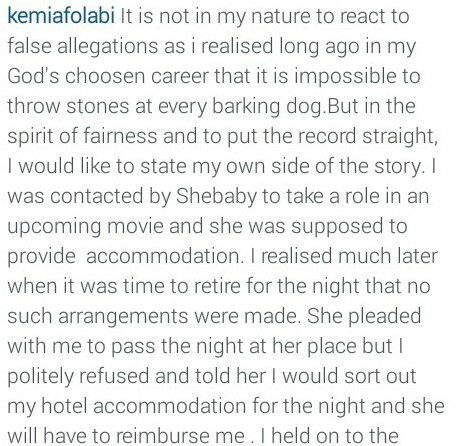 She Baby however slammed Kemi's report calling her a blatant liar that wanted to cover the truth. She even went ahead to accuse Kemi who is also married of having a relationship with Odunlade. "I had a movie shoot recently,and Kemi Afolabi happened to be one of the actors I used. She ought to come 10 am,but she got to the location 5 pm. She had just three scenes with us,and I paid her fully already for her role. I was angry she already disrupted part of what we intended using her for because she didn’t come as scheduled. But was persuaded by my director to change her role which she finished around 10 pm. “I lent her my clothes in the course of shooting. She now held on to the clothes as a bait,insisting I must pay for her accommodation which wasn’t in our budget. If she had come earlier as agreed,she would have been released in time because it’s just three scenes. “Kemi now held on to my clothes for two about months. All efforts to get her on phone proved abortive. She wouldn’t reply all my messages neither would she pick my calls. After what seems like eternity, because we ain’t that close, I was feeling uncomfortable leaving the clothes with her. I decided to call her friend, Sikiratu Sindodo and reported Kemi to her. And Sindodo persuaded me that it will be settled. “Until I called Kemi, and she yelled at me. And she was angry that I reported her. She now insisted she won’t give me the clothes until I pay for the said hotel room which wasn’t in our contract. All further efforts to get the clothes proved difficult, and I was angry. 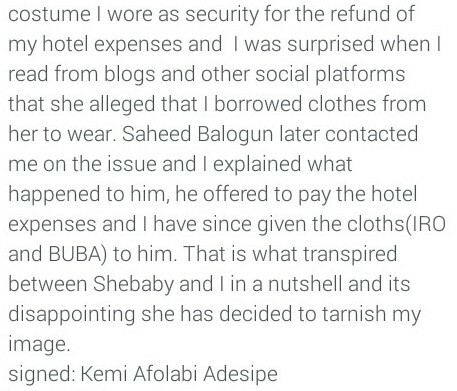 I later wrote on my PM about the clothes and Saidi Balogun intervened. And I pulled it down immediately. "I don’t want to make any further comment on the issue. I am too busy for that. I have a lot things I am doing now. So, I can’t be talking on any trivial issue of such. She Baby is the one looking for cheap publicity.